My first encounter with a GT6 was when a businessman called on my Dad back in the early 1970s in a white Mk 2. I have a memory of it parked in our drive in Heswall, and I was struck by how pretty the car was. While browsing a newsagent in May 1979 I came across issue number 1 of a new classic car magazine called Old Motor (now defunct). 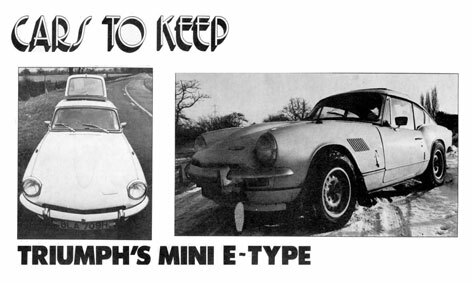 An article under the heading CARS TO KEEP described Triumph's "Mini E-Type", the GT6 (see "Articles"). The car featured belonged to Consultant Editor Roger Bell, a well known motoring journalist and sometime racing driver. In later correspondence with a member of the editorial staff of the magazine (when I was PR Secretary of the TSSC), I asked if Roger Bell still had the car. The response quoted him as describing the GT6 as "a brave man's car". When, in early March 1980 I saw one advertised for sale in the Denbighshire Free Press, in Denbigh, I had to go and see it. Although the condition could have been better, I loved it, especially as it was a late Mk2 with the reclining seats and other improvements. A quick visit to my bank manager soon gave me the means to pay Kevin Liversage the asking price of £400.